Home » Events » Its a WoolWench Giveaway! Oh my! I am not one for numbers, quite honestly, I don’t even know how old I am most of the time, and I don’t usually look at my Facebook stats or website numbers, but today I did and imagine this, we are over 24000 likes on my Woolwench facebook page! Wheeee! When did that happen?! I think its time to celebrate our growth and share some inspiration, so I would like to offer something special, something I have made… It is also my birthday soon too! So lets call this a double celebration! 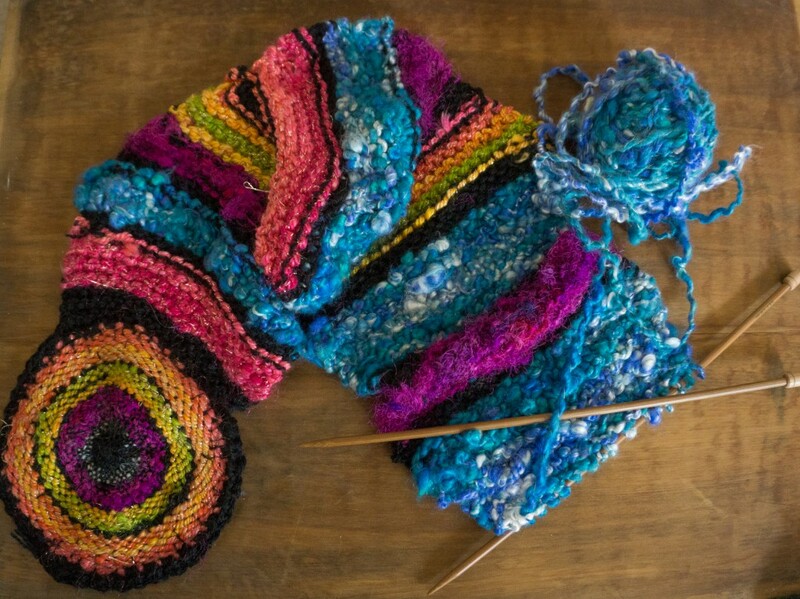 complete with tutorial videos and written instructions – they are all still there in a series on the Majacraft blog if you would like to try one of these yourself! Majacraft makes the original wooden circular weaving looms and you can find out more about how to use these with their free tutorials and pattern book at the bottom of the loom page, and for more inspiration you can also visit the Circle Weaving Facebook page . 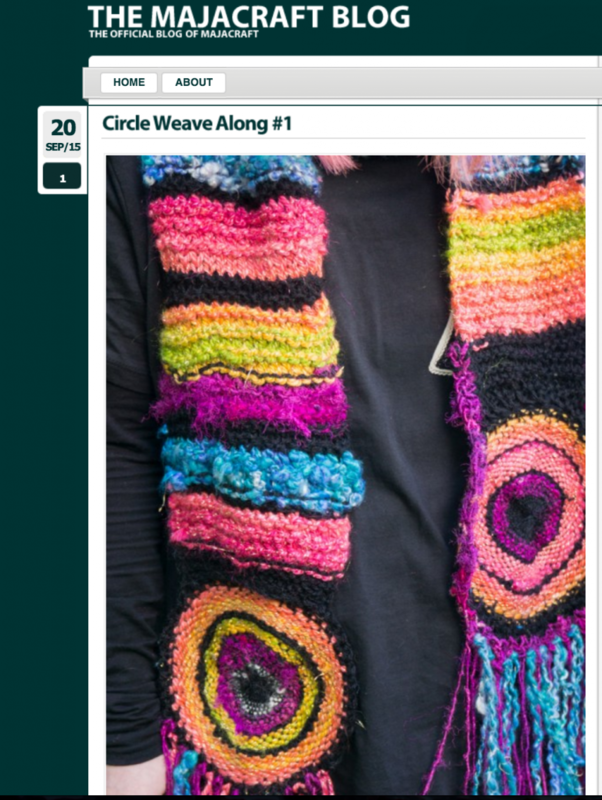 We started that group way back when we had just brought out this new ‘circle weaving thing’ with our Fiberygoodness Creative Spinning course Journey to the Golden Fleece, – which we are about to relaunch for the fourth time! (wow time flies!). Since then, circular weaving has really taken off! Lots more people are joining in on this wonderfully simple and portable weaving, its just one of those mysterious things that once you start you cant stop! So here is the end result of the Circle Weave Along example that you can see me making through all the instruction videos! Modelled for me by my beautiful daughter 🙂 Scroll down to read how to get in the giveaway draw! I will ship to you anywhere in the world.. Enter with a comment below to be in the draw to win ! Please share this post and leave me a message to tell me what treats you like on your birthday! I’ll close this on (my) Sunday! GOOD LUCK! I can’t wait to see how far this scarf will travel! What a beautiful scarf and a wonderful source of inspiration for me. Happy birthday Suzy! Really love this scarf for two reasons: It is So Beautiful, and it lead me to this website! Lovely so pretty! Birthday treats….breakfast in bed which includes waffles, then spinning something very expensive on my porch while watching my horses graze and letting the rest of the day unfold. Congratulations on such a wonderful milestone. My birthday is on March 3 and as per Friesian tradition, at least in our household, you have your family over for coffee and cake. This will be done again and then have a nice dinner with dear hubby. I don’t like a lot of pomp and circumstance though. Just a quiet celebration. 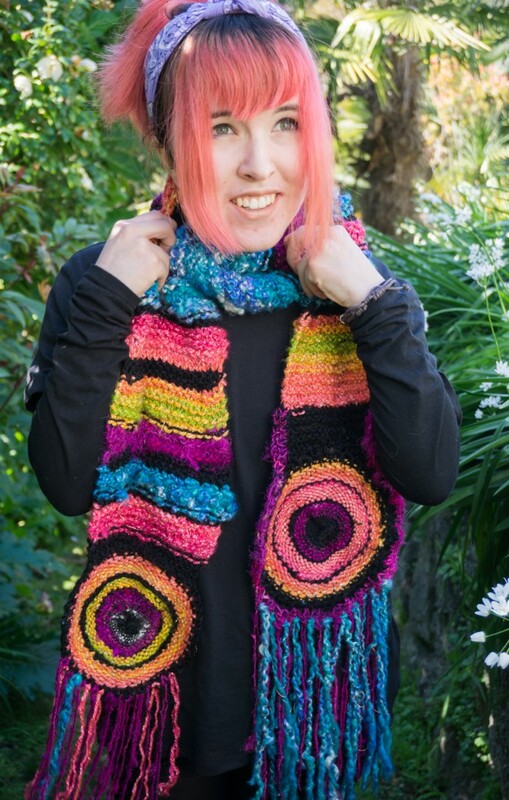 This scarf makes me feel happy : ) I love things that look like someone had fun creating them! I would love to win the loom. My favorite birthday gifts are stationery, books, candy, and handmade soap. Congrats on the new book! Many more to come I hope! Thank you for sharing your knowledge with people that can’t afford to join just now! What a fun scarf! Wishing you a happy birthday. Mine is next month. My gift to myself this year is a weaving class sponsored by my spinning group. Will be a fun one! What a beautiful daughter who is wearing an amazing scarf! Because of you we started weaving on circular looms (my daughter and i). On my birthday I enjoy putting all other work aside and dying some beautiful fiber some beautiful colors. Then going out for a wonderful dinner (with relaxing martini) with my family. Doesn’t get any better than that! Beautiful scarf, such happy colors! Happy Birthday and Congrats on the new ebook you will be coming out with. I know it is going to be a great one like the others. I have 3 of them already and love them, so much wonderful information in them,oh and recipe cards are the bomb!!! Treats on my birthday, which is next month, fiber, fiber, and more fiber!! HA. Love the scarf! Way to go! Congratulations, Suzy! What a great result for your hard work all these past years. I enjoy the courses of FiberyGoodness and learned a lot and I hope to enroll again in the future! My birthday is coming up soon and as an introvert all I need is my Aura, fibery softness, dye pots to create gorgeous colours and a course from my favourite Fibery community. The scarf is beautiful- just like both the wearer and the creator. I join in with all the others in wishing you a Happy Birthday. Mine is next month and I will be a bit sad in not being able to spend it with my beautiful daughters, but I will be teaching a class of 29 ten year olds so I’m sure we will have fun.